Every football fan has heard Vince Lombardi's famous adage: "Winning isn't everything, it's the only thing." The same is true of Knute Rockne's exhortation to "Win one for the Gipper." Quotes like these have become part of football's lore.Less well known is Alex Karras's advice on the best way to stop All-Pro running back Jim Brown: "Give each guy on the line an ax." Or Randy Cross's opinion of his fellow players' intelligence: "The NFL, like life, is full of idiots." And then there's this glimpse into Bill Parcells's game plan: "If my quarterback runs, I'll shoot him. 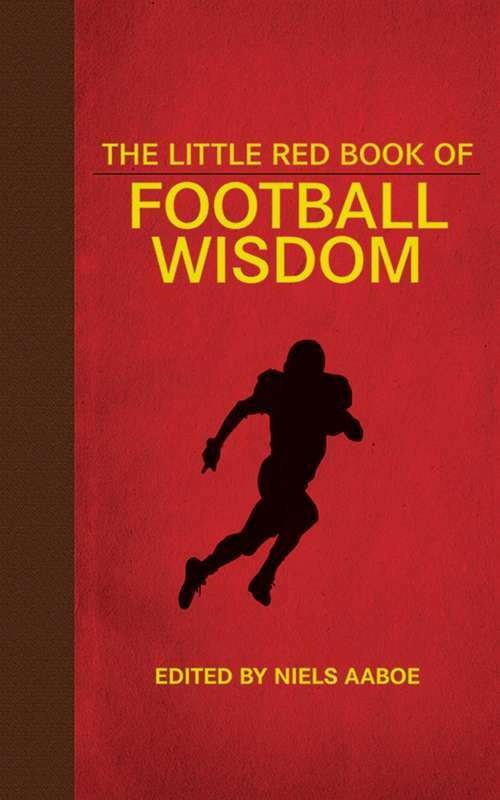 "The Little Red Book of Football Wisdom is a collection of witty and hilariously irreverent quotes about America's most popular sport. Players, coaches, celebrities, and literary giants weigh in on the best--and worst--football teams, athletes, games, fans, and more. These are just some of the folks whose words appear in these pages:Joe Namath David HalberstamJoe Montana Paul HornungDeion Sanders Mean Joe GreeneRichard Nixon Jerry SeinfeldBarack Obama Bruce SpringsteenHunter S. Thompson Faith HillErnest Hemingway And dozens of others!With a rich history dating back nearly 150 years, football is America's game. Through the words of people who've played, coached, and cheered the games, The Little Red Book of Football Wisdom brings football's vibrant tradition to life.